Enterprise zones are playing a vital role in delivering greater prosperity to our economy and have now created more than 15,500 jobs for hard-working people across the country since opening for business, Communities Secretary Eric Pickles has announced. Figures released today (23 February 2015) show the government’s 24 enterprise zones have created thousands of jobs, attracted over 480 businesses and more than £2.1 billion in private investment across a range of key industries including the automotive, aerospace, pharmaceutical and renewable industry sectors. There is now activity on all enterprise zones, whether it is continued growth on established sites or former derelict sites being brought back to life thanks to the government’s vision and funding. That means knock-on benefits for local communities, including improved infrastructure and new business opportunities. The growth has also provided a significant boost to the UK’s construction sector and wider supply chain. The Communities Secretary heard first-hand how the sites are creating highly skilled jobs during a visit to Cosworth’s brand new £22 million advanced manufacturing centre at Northampton’s Enterprise Zone last week. The facility will allow the company to fulfil £75 million of new contracts to produce high end machine components for high performance road vehicles, creating an additional 70 jobs and apprentices. The enterprise zone is building a deserved reputation as a centre for automotive and manufacturing excellence with more than 130 businesses on site. The University of Northampton is also embarking upon an ambitious £330 million move to the business park, creating a modern, purpose-build campus for more than 14,000 students. 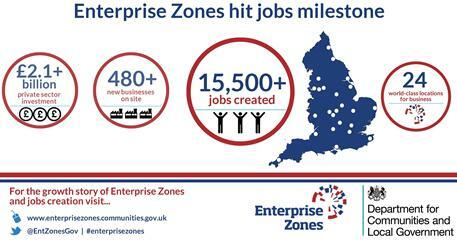 Enterprise zones are now picking up the pace and really starting to deliver for the economy. We’re seeing activity across the country from established sites attracting some of the biggest names in business to derelict sites being brought back to life. That’s because our long-term economic plan is giving businesses the confidence to invest. They know that enterprise zones work and are making the most of the top-class incentives and world-class infrastructure on offer. And that’s great news for local economies and communities because it’s these kinds of businesses that have the vision to grow, creating thousands more jobs for hard-working people. The growth has also provided a major boost to the UK construction sector with work already carried out to redevelop more than 100 hectares of land and deliver more than 5.4 million square feet of new or refurbished floor space. This includes so-called speculative builds where investors are also so confident they will let new buildings that they start work before having tenants lined up to move in. More than £230 million has been committed to 31 of these projects across the country so far, meaning at least 1.8 million square feet of new office and industrial space will be rolled out by 2018 – the equivalent of more than 23 Wembley football pitches.